Spacers are unthreaded and cylindrical or hex in diameter. They are used primarily in minimum clearance space requirements such as circuit board mounting and other applications where dimensional tolerances are tight. 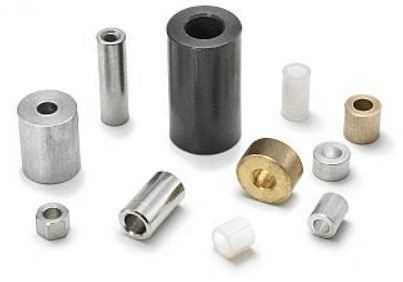 RC Fasteners and Components is your source for superior quality spacers at competitive prices. Our spacer inventory and pricing is bound to keep you coming back. Contact an RC certified spacer specialist today and find out what people are talking about. Brass is used in making high quality spacers. It’s conductive, resists corrosion and is non-magnetic. It is costlier and heavier than aluminum and is usually plated zinc or nickel. Nylon is a good insulator and has a surface smoothness which will not fray the insulation of wires that rub against it. Stainless has the advantages of brass but has superior resistance to corrosion and chemical fumes. Steel is used in applications requiring greater strength, but is heavier than aluminum and does not resist corrosion like aluminum, brass or stainless.